Travis Hill was the grandson of Jessie Hill (of “Ooh Poo Pah Doo” fame) and a member of the Andrews-Lastie family, which includes Troy “Trombone Shorty” Andrews. 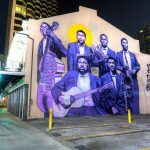 Hill and Andrews grew up in Treme in the 1990s, where they played their horns together. As a teenager, Hill pleaded to an armed robbery charge and spent more than eight years in prison. He got out in 2011 and devoted himself to music, forming a band of his own called Trumpet Black and the Heart Attacks. Two years later, though, his comeback ended in a bewildering tragedy. After having some dental work done, he flew to Tokyo to perform and developed an infection in a tooth. It spread to his heart a couple of days later and took his life at age 28. This mural was painted by Brandon “BMike” Odums little more than a week after Hill’s death in 2015. Odums, who knew Hill, based the image on a photo by Gus Bennett. He chose this site for it because it was here in the Sixth Ward where Hill grew up playing in second line parades. Travis "Trumpet Hill" Black Live at Vaughan's June 5, 2014. 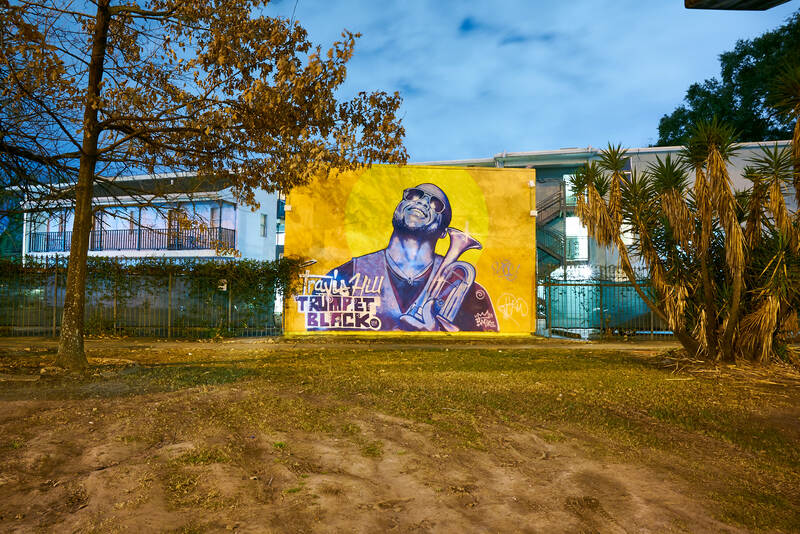 Artist Brandan Odums discusses his two-story tribute to Travis "Trumpet Black" Hill in Treme. 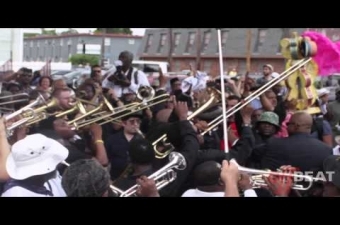 Travis "Trumpet Black" Hill's Funeral in New Orleans in 2015. Mural of Travis Hill, aka Trumpet Black, on North Claiborne Avenue. 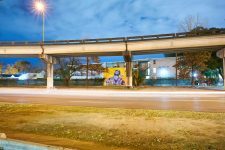 It was painted shortly after his untimely passing by his friend, the artist Brandan "BMike" Odums.